It’s a sunny Monday morning and I’m sitting on the balcony, having just concluded a conversation with Jazzy about Joss Whedon and feminism. She’s not happy with his latest movie, and what he had to say about it, in terms of his disavowment of feminism as a political entity. My take on it was that, a person is known for the sum total of his/her body of work. With Buffy, Angel, Firefly, and Dollhouse, he broke barriers. He inspired a whole generation of writers. One movie should not undo all the good he’s accomplished in his career. Jazz isn’t willing to let him off the hook so easily. I’m finally starting to feel like I can stretch my brain out for a bit. I taxed it pretty good over the passed week, tangling and untangling the nuances of my spec script. After plotting, thinking, rethinking, refining, and eventually committing to the story, I wrote three Acts in four days. I wrote during slow periods during the day on the movie, and I wrote in every spare second of my evenings. I don’t even know how I did it. I recall it as some kind of a foggy dream. I know what’s on the page, but I don’t recall exactly how it got there. The words just kind of showed up. I think the script is good. I think it holds up. I really need to get some more eyeballs on it, so I can say for sure. I’m certain there will be tweaks and refinements, but I think it’s structurally sound. As of right now, I don’t have a great deal of interest in looking at it. We need a bit of space from each other – the script and I. Another week should be good. The day has cleaning in store for me. Cleaning and laundry. And a shower. 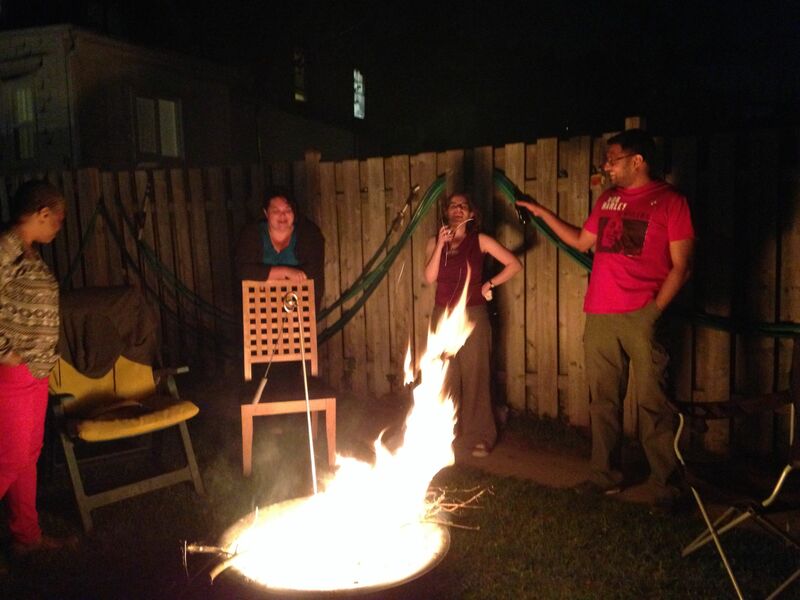 But for a backyard bonfire on Saturday night, I really limited my contact with humanity. This weekend really was a well earned retreat from the rest of the world. I’m just about ready to jump back in on Tuesday. I’m sitting in Mullin’s with a pint at the ready, and nothing but a thankful sense of accomplishment sphereing my vibe. I got my CFC application in. I got my spec script for The Blacklist done. I did it while working 60 hours per week on a movie. I’m completely out of words right now. Wrote so much, so fast, for so long, none more feel like coming out. I just wanted to mark the occasion with a blip in my blog. I’ll have more to say tomorrow.